Successfully Added Digital Camcorder - UHD 2880x2160 Resolutions, 1/3 Inch CMOS, 3 Inch Screen, 270 Degrees Screen Rotation, 30x Zoom, IR Mode to your Shopping Cart. 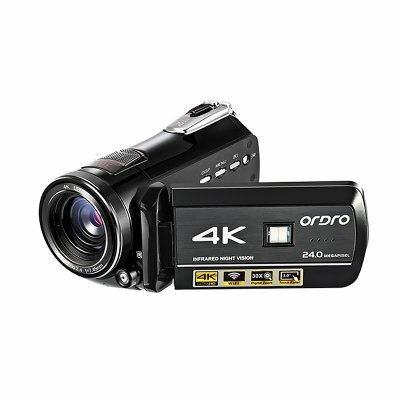 Some things only happen once in life - a baby's first steps, graduation, marriage - with this 4K camcorder you can save all the memorable moments relive time and time again with friends and family. With a 1/3 inch CMOS sensor, this handheld camcorder can capture video in 2880x2160 resolutions so you can enjoy stunning home movies in breathtaking quality. The lightweight design and compact size make it easy to carry around or pack in your bag for days out and holidays. Whether it's a sporting event, your child's birthday or a family gathering you'll be able to record the special moments in life without missing a single detail. A 3 inch LCD screen makes lining up shots and replaying the footage quick and easy. AS the screen can swivel through 270 degrees you'll find it easy to see what your recording no matter the camera angle. This camera features 30 times zoom as well so you can get great close up shots even from the other side of the room. So you won't miss a single detail. Packing a 1700mAh battery let you use this digital video camera for up to an hour of continuous recording. There is even app support for Android and iOS devices so you can transfer the video via the video cameras wifi to your smartphone for sharing with friends or uploading to your social media profile. The camcorder has an anti-shake feature letting you capture more stable footage while on the go. There is also face detection making it easier to keep focused on our subjects. With micro SD card support, the camera allows you to add 128GB of external memory which is enough space to store hour’s worth of special memories. When it comes to playing back the footage you can simply plug this video camera into your TV as it has an HDMI output. CApture and share all the special moments in life with this great video camera. It comes with a 12 months warranty, brought to you by the leader in electronic devices as well as wholesale electronic gadgets.